KAWS, one of street art’s favourite artists, who has previously collaborated with Pharrell, Kate Moss and Kanye West, is about to open his first-ever UK museum exhibition. Yorkshire Sculpture Park (YSP) will present the exhibition by KAWS, the renowned American artist, whose practice includes painting, sculpture, printmaking and design. The exhibition, in the expansive Longside Gallery and open air, features over 20 works: commanding sculptures in bronze, fibreglass, aluminium and wood alongside large, bright canvases immaculately rendered in acrylic paint – some created especially for the exhibition. 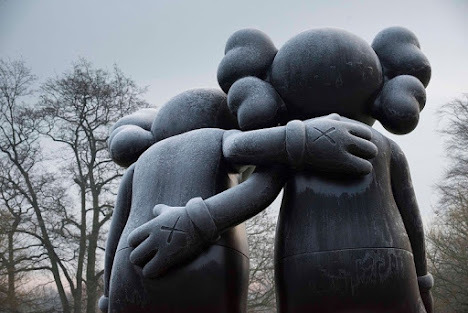 The Park’s historically designed landscape becomes home to a series of monumental and imposing sculptures, including a new six-metre-tall work, which take KAWS’s idiosyncratic form of almost-recognisable characters in the process of growing up. Brooklyn-based KAWS is considered one of the most relevant artists of his generation. His influential work engages people across the generations with contemporary art and especially opens popular culture to young and diverse audiences. A dynamic cultural force across art, music and fashion, KAWS’s work possesses a wry humour with a singular vernacular marked by bold gestures and fastidious production. KAWS absorbs popular imagery to produce works that are semi-familiar, with layers of contradictions and subtleties. 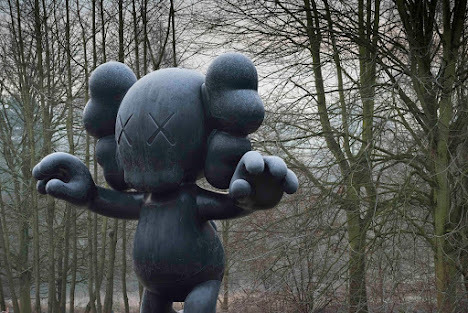 Outdoors, with their outsize and monumental proportions, KAWS’s sculptures bring to mind dystopian cartoon characters; recognisable personalities from childhood who appear to have lost their innocence. Against the Park’s tree line, the group of six works in natural and black-stained wood, measuring between six and 10 metres in height, are simultaneously spectacular and plaintive. Once bright, iconic characters are rendered in disheartened, world-weary poses; imposing yet full of pathos, they point to an array of psychological narratives, suggesting compassion, surprise and despair. The artist has also made a series of five paintings especially for the exhibition. Each measuring 112 x 92 inches, they will span the largest wall of the spacious gallery, creating a swathe of brilliant colour and complex energy. Constructed with painstaking attention to detail, the abstracted forms overlay and interweave, forming shadows and deepening space to reveal a slinking, enigmatic figure. Yorkshire Sculpture Park, West Bretton, Wakefield WF4 4LG. 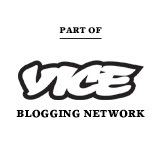 Visit the YSP website for more info and directions.